Meetings; second and fourth Saturdays, 111 East Houston St. Organized in 1910 with 13 members, now: 200. Element: a mixture 10% American-born. Language of meetings: English-Yiddish. Goal: Mutual aid, death benefits, illness benefits, burial ground, synagogue, supporting local institutions. Secretary: A. Bogitski, 125 Pitt St., New York. The Vice President was Harry Welinsky. According to the records of the Mount Lebanon Cemetery, in November of 1976 the membership of the Pokotiliver merged with the Workmen's Circle. The workmen's Circle can be reached at their New York City headquarters: 212-889-6800. Mount Lebanon Cemetery information: The Pokotiliver grounds are known as Block L, Section 2. Entering the block and section information into our interment search will bring up all burials on the Pokotiliver grounds. All inquiries should be made directly from this link to the Mount Lebanon Cemetery website. 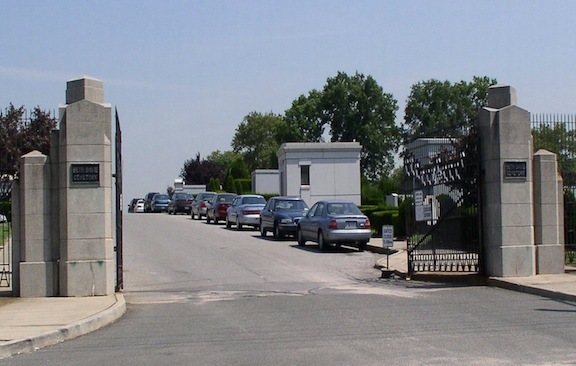 At the Beth David Cemetery in Elmont, NY, there are buried seventy five members of the Society. Pokitilover Benevolent Association "Honor Scroll" award to Israel Stiefel in 1946 for "services to our people." Jacob Stiefel, was a member of the Pokotiliver Benevolent Society. Buried in Trumpeldor Street Cemetery, Tel Aviv, section Gimmel, Row Vuv, number 4.